Multiple Grammy-winner Rod Stewart has enjoyed a long and varied career, beginning with his tenure in "The Jeff Beck Group" and the rough rock band "The Faces". His solo career also ran the gamut; from folk-rock to pop to soul-influenced ballads, his releases always met with success due to his rich and infectious voice and personal charisma. VH1 presents here a live performance at the New York's glamorous Supper Club featuring songs from throughout his musical tenure, including "Maggie May," "Forever Young," and "Tonight's the Night," as well as "Have I Told You Lately" and "Hot Legs," two bonus tracks not included in the original broadcast. Stewart also tells the stories behind the inspiration and development of some of his biggest hits. After the whole Unplugged thing ran its course, the music channels needed a new way to showcase performers in an unusual manner. The folks at VH1 came up with Storytellers. In this setting, notable musicians would play their tunes and tell us about the songs. 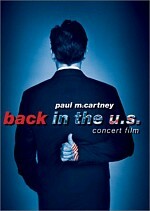 Half concert and half documentary, this series never caught fire like MTV’s Unplugged, but it proved successful enough. This concept works best when it features artists with a substantial history, so someone such as Rod Stewart makes for a good match. Heck, his career benefited from the Unplugged treatment in 1993, so why not give this other format a go? Shot in the spring of 1998, this program features nine songs from different parts of Stewart’s career, though many go back to the Seventies. Stewart’s best-known track, “Maggie May” comes from his 1971 classic Every Picture Tells a Story, while “Stay With Me” is off of that same year’s Faces release A Nod Is As Good As a Wink to a Blind Horse. From 1976’s A Night On the Town, we get “Tonight’s the Night (Gonna Be Alright)” and 1977’s Footloose and Fancy Free presents “You’re In My Heart (The Final Acclaim)”. We jump to 1988’s Out of Order for “Forever Young”, and 1993’s Unplugged… And Seated gives us a cover of Sam Cooke’s “Having a Party”. Finally, more covers show up for the last three songs. Rod redoes himself via a take on Faces’ “Ooh La La”, and he reworks Oasis for “Cigarettes and Alcohol” and Primal Scream for “Rocks”. All three of those appear on 1998’s When We Were the New Boys. 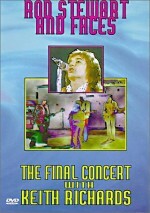 Rod was one of the first five concerts I ever attended, and I remained an active fan for quite some time. I bought most of his new albums and went to see him whenever he came to town. However, Stewart eventually burned me out because he put out so much shoddy music and so many lackluster live performances. Nothing in Storytellers dispels my feeling that Stewart lost it years ago. “Lost it” may be too strong, as it implies that he no longer possesses skills. I can’t quite figure out how much talent Rod retains. His voice certainly sputters during this show, as his vocals go from pretty good (“Ooh La La”, “You’re In My Heart”) to fairly terrible (“Maggie May”, “Tonight’s the Night”). I feel tempted to blame age and abuse for the vocal issues, but a trend develops during Storytellers that leads me to question that theory. When Rod concentrates, he does reasonably well. It’s only when he preens and struts more than sings that he really falters. Unfortunately, those situations fill most of the show. Rod only focuses on “Ooh La La” and “Heart” because he doesn’t know the lyrics well. When he feels more comfortable, he plays around and seems wholly unconcerned with the music. Don’t construe my disdain to mean that I don’t like active visual performers. On the contrary - I hate to see acts who just stand there and don’t give us a show to watch. However, the performers need to draw a balance, and Rod goes too far to the goofy side of that. He clearly regards the music as an afterthought and prefers to prance and parade around the stage. This works best in a large arena setting, but in the small venue seen here, it comes across as ridiculous. 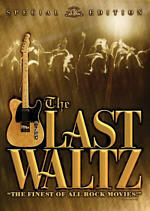 Ever since the mid-Seventies, Stewart has picked backup musicians who fail to challenge him. Fans still wince at the memory of his 1984 tour, which almost reunited him with guitarist Jeff Beck. Unfortunately, that didn’t occur, and Stewart continues to feature musicians who possess decent skills but who fail to bring personality to the music. They seem perfectly competent but flat. Tracks like “Stay With Me” should rip up the stage, whereas the version here is little more than a slightly peppy toe-tapper. Any fan who expects much from the “storyteller” elements will leave disappointed. Rod takes a handful of softball questions and tosses out very minor notes between songs, but we don’t get anything insightful. Stewart proves moderately amusing at times and that’s all. His remarks stay superficial and fail to give us any understanding of the music. I like the Storytellers concept but don’t find much of interest in the Rod Stewart edition. The once-great singer continues his downward spiral with yet another perfunctory and lackluster performance, and he doesn’t utilize the “storytellers” concept well. It’s a bland program. 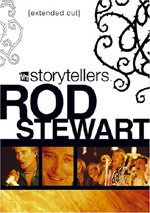 Rod Stewart: VH1 Storytellers appears in an aspect ratio of 1.33:1 on this single-sided, single-layered DVD; due to those dimensions, the image has not been enhanced for 16X9 televisions. A fairly ordinary program, Storytellers looked decent and that was it. Sharpness varied. Close-ups usually seemed acceptably concise and distinctive, but anything wider became more of a crapshoot. Some of those elements were pretty firm, but others turned rather soft and fuzzy. Some jagged edges and shimmering occurred, but I didn’t notice any edge enhancement. As for source flaws, the image looked a bit grainy at times, and I saw a blemish or two. As with most concert presentations, most of the colors emanated from lighting, though Rod’s loud jackets added some spark to the palette. His coats looked fine, but the lights tended to appear moderately messy and dense. The shots with simpler illumination looked much more satisfying, as those with heavier lights were runny. Blacks appeared pretty dark, and shadows didn’t play a big role. They appeared reasonably concise when they occurred. Ultimately, this was a mediocre picture that lacked any particular strengths. On the other hand, the Dolby Digital 5.1 soundtrack of Rod Stewart: VH1 Storytellers offered some very good elements. Unfortunately, it lacked one necessary component that would have made it an “A”-level mix: bass. The track consistently failed to deliver much low-end response. Some mild bass came through during the show, but that was it. The absence of those elements meant the audio left a less than stellar overall impression. That was too bad, for everything else about the track worked well. The quality of the mid-range and highs seemed very good. Vocals were lively and natural, while guitars, horns and other instruments appeared crisp and tight. Drums snapped well, though they lacked the low-end pop. I heard a bass guitar and other bits from that realm, but I didn’t remotely feel them. The soundfield didn’t go nuts, but it broadened the material quite nicely. The surrounds boasted good reinforcement of the forward channels and presented solid involvement from the audience. Stereo separation in the front was terrific. Rod’s vocals always stayed firmly anchored in the center, while the other instruments spread smoothly across the soundscape. They were appropriately placed and left with plenty of room to breathe. Guitars were split distinctly into one channel or the other, and everything else ended up somewhere between those extremes. This worked well and gave the program a fine sense of place. If only it’d included better low-end response, this would’ve been an “A” mix. As it stood, the track earned a “B”. Only a few fairly minor extras complete the package. We get two bonus tracks: “Hot Legs” (three minutes, 49 seconds) and “Have I Told You Lately” (5:14). We can watch both with the same stereo or 5.1 tracks that accompany the main feature. Rod wore out 1977’s “Hot Legs” years ago and brings nothing new to it. The track also suffers from weak vocals ala the main program’s wretched “Maggie May”. Rod popularized his cover of Van Morrison’s “Lately” with his Unplugged album in 1993. It was a sappy rendition then and it’s not improved with age. He provides erratic vocals and hits more than a few clunkers along the way. Neither “Legs” nor “Lately” include any “storytelling” elements. Rod Stewart hasn’t mustered many standout moments over the last 30 years, and Storytellers doesn’t function as a career highlight. A wheezy and lifeless performance, Stewart mostly sounds bad and he doesn’t explore the series’ format well. The DVD presents average picture with flawed but generally good audio and a few small extras. Storytellers comes with a low enough list price to entice fans, but if you’re not a Stewart diehard, you likely won’t get much from this show.